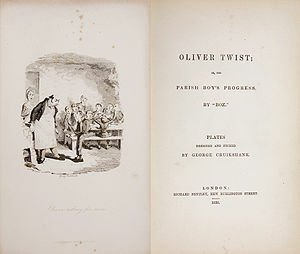 Oliver Twist, or The Parish Boy's Progress is a novel by Charles Dickens. It was published by Richard Bentley in 1838. The book tells the story of a naive orphan boy who is led into a life of crime by a band of young pickpockets. Famous characters include: Mr. Brownlow, the Artful Dodger, Bill Sikes, Nancy, and Fagin. The novel has been the basis for several movies, stage plays, and the 1960 British musical, Oliver! This page was last edited on 10 June 2018, at 03:21.